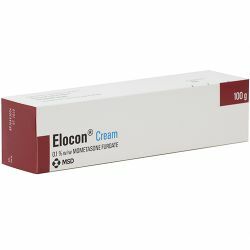 Elocon Cream is one of a group of medicines called topical corticosteroids. It is classified as a “potent corticosteroid”. These medicines are put on the surface of the skin to reduce the redness and itchiness caused by certain skin problems. In adults and children, Elocon Cream is used to reduce redness and itchiness caused by certain skin problems called psoriasis or dermatitis. Psoriasis is a skin disease in which itchy, scaly, pink patches develop on the elbows, knees, scalp and other parts of the body. Dermatitis is a condition brought on by the skin reacting to outside agents e.g. detergents, causing the skin to become red and itchy. 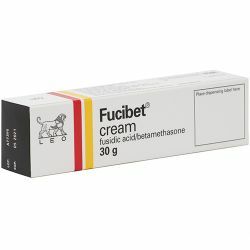 Elocon cream and ointment both contain the active ingredient mometasone furoate 0.1%, which is a type of medicine known as a topical corticosteroid. 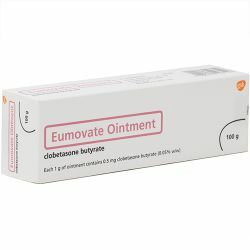 Mometasone ointment is also available without a brand name, ie as the generic medicine. Mometasone is a potent steroid used to reduce inflammation in the skin. Mometasone acts inside the skin cells to stop the release of these inflammatory substances. 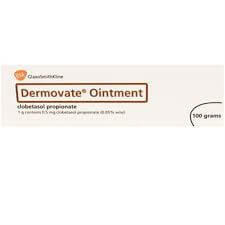 This reduces the swelling, redness and itching and so helps prevent scratching that can further irritate the skin. Elocon ointment is more greasy than the cream. It is more suitable for very dry, scaly areas of skin, whereas moist or weepy skin is best treated with the cream. A thin layer of Elocon Cream should be gently rubbed into the affected area of skin once a day. Elocon cream or ointment should be applied thinly and evenly to the affected area(s) of skin once a day. Don't apply Elocon to broken or infected areas of skin, unless the infection is also being treated. Don't apply it to the face unless instructed to by your specialist. Don't apply it around your eyes or eyelids. Wash your hands thoroughly after applying Elocon, unless the hands are the area being treated. Don't cover the area being treated with airtight dressings such as bandages or other dressings unless directed by a doctor, as these increase the absorption of the medicine into the body and so increase the risk of side effects. If your doctor has advised you to use dressings with Elocon, you should cleanse the skin before applying the cream or ointment under a fresh dressing. Be aware that nappies and waterproof pants can act as an airtight dressing and can increase the absorption of the medicine. The other ingredients are: hexylene glycol; purified water; phosphoric acid; titanium dioxide; aluminium starch octenylsuccinate; white wax; white soft paraffin and hydrogenated soybean lecithin. Warnings and Precautions Talk to your doctor, pharmacist or nurse before using Elocon:  If your skin becomes irritated or sensitive after using Elocon, you should stop using it and tell your doctor. Contact your doctor if you experience blurred vision or other visual disturbances. What are the possible side effects of Elocon? Medicines and their possible side effects can affect individual people in different ways. Potent topical corticosteroids like Elocon have more potential to cause side effects than milder steroids. However, when applied sparingly, no more more than once a day, as directed by your doctor, side effects are still rare. Side effects are more likely if you use Elocon on extensive areas of skin, broken or raw skin, delicate areas of skin like the face, areas of skin that rub together like armpits or skin folds, or if you use it underneath airtight dressings or for long periods of time. The following side effects are known to be associated with topical corticosteroids. Just because a side effect is stated here doesn't mean that all people using Elocon will experience that or any side effect. Skin irritation, eg redness, rash, itching or burning on application, or allergic inflammation of the skin (contact dermatitis). Stop using Elocon and consult your doctor if you think you have experienced a reaction or your skin condition appears to be getting worse. Spread or worsening of untreated skin infections. Thinning of the skin. Reduced skin pigmentation. Stretch marks (striae). Groupings of fine blood vessels becoming prominent under the skin (telangiectasia). Excessive hair growth (hypertrichosis). Acne. On rare occasions enough corticosteroid may be absorbed to have side effects on other parts of the body, for example a decrease in the production of natural hormones by the adrenal glands or Cushing's syndrome. You can read more about the possible side effects of topical corticosteroids here. If you experience any changes in your vision while using Elocon, such as blurred vision, you should tell your doctor.